The 5MR must go on. 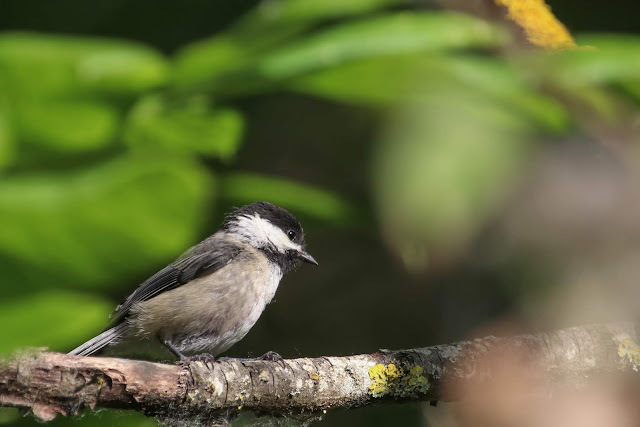 A thick layer of dust had accumulated on my 5-mile radius list this summer and I decided it needed a sprucing, a revival, a brand new 5MR bird to bring it back from the dead. 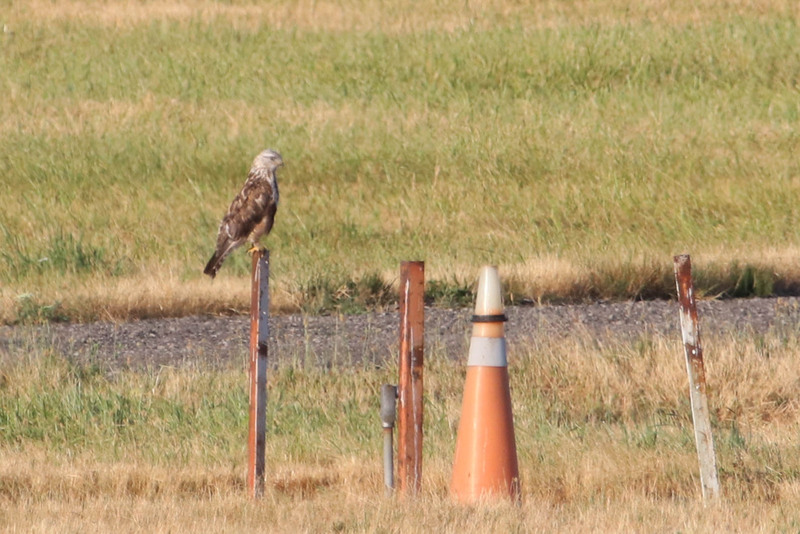 Conveniently a Rough-legged Hawk has been hanging out by the Portland airport for months, often seen from Broughton Beach. It didn't dawn on me that this was in my 5MR until Jacob saw it from his work (next to the airport) and I was like WAIT A MINUTE. I finally made it over there recently to check it out. "It came from a nest site in Alaska the summer of 2016, spent some time in a rehab facility in Alaska as a result of an injury, and missed the opportunity to migrate south with its cohort. It was flown to Cascade Raptor Center near Eugene where it spent additional time prior to release. It was caught at PDX back in April or May of this year and released in Washington Co. It returned soon thereafter and, as you all know, has been around since. So, it's confused. The hope is that it will find some friends when the Rough-legged Hawks return to our area this fall and follow them back north in the spring. If not, it may end up pairing with a local redtail." A pretty interesting story! For now this bird has plenty to eat on the airport grounds, and I am guessing they are not planning on catching and moving it again. Broughton Beach was not particularly interesting that day aside from the hawk but I managed a few 5MR year birds anyway. 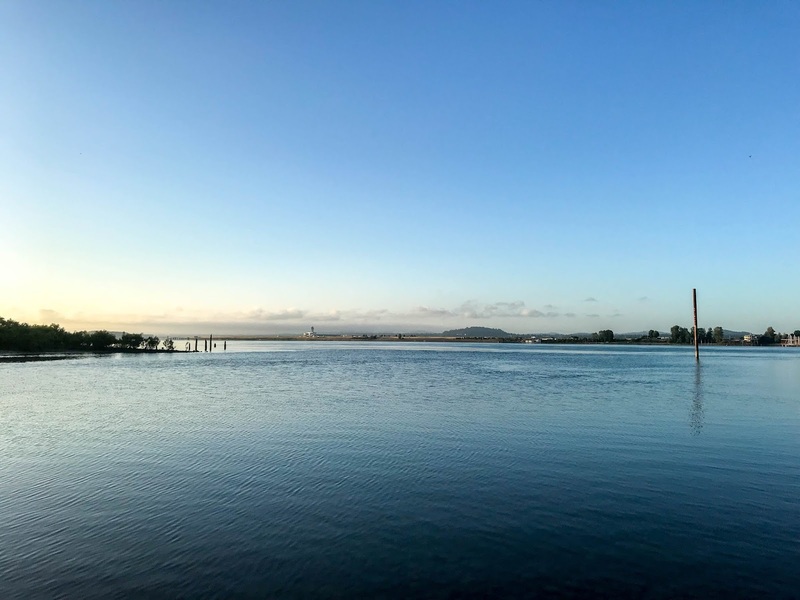 This inspired me to hit up more 5MR spots, starting with a park I had not realized was inside my radius: Marine Park on the Columbia River. Don't ask how I missed this important information. There's a nice bike path that leads from the main beach access along some wooded swampy areas, back out to the river and all the way to Wintler Park. Of course there were Osprey nests. 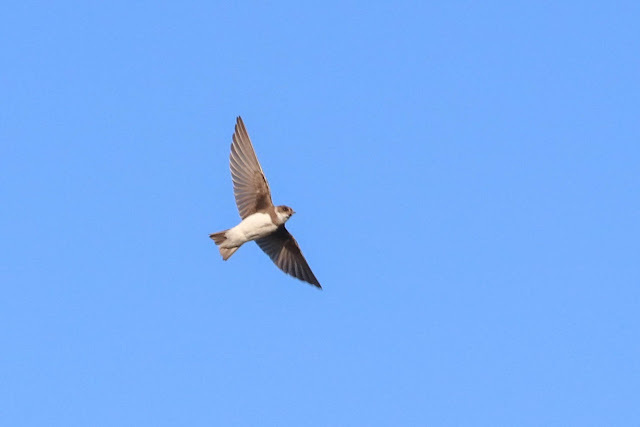 I was psyched to find a couple Bank Swallows in a swallow/swift swarm as it was not only a 5MR year bird, but also a county year bird. 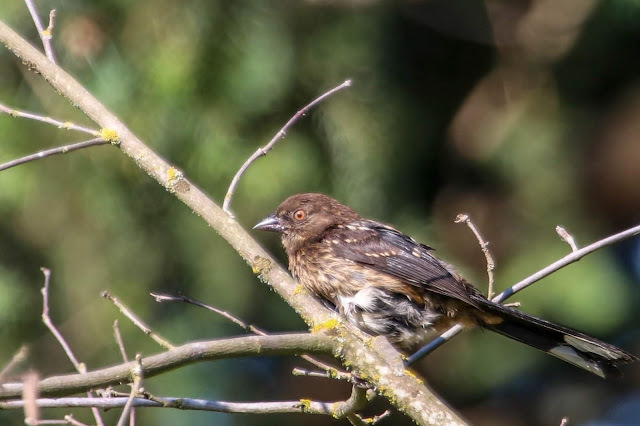 There were tons of young cowbirds along the trail and I was most disturbed to see a Song Sparrow with a trail of not one, not two, but THREE. Ugh. 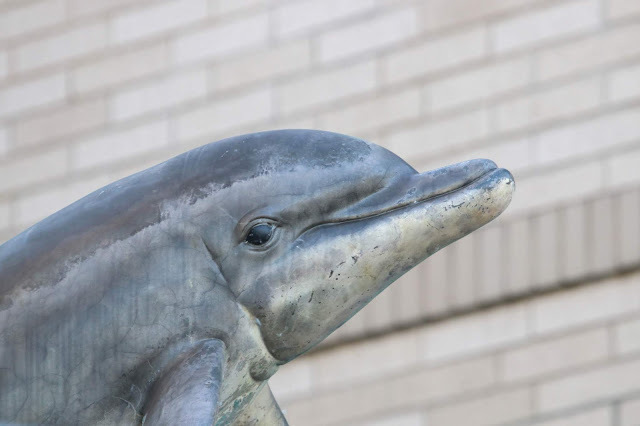 Good thing this dolphin was around to cheer me up. 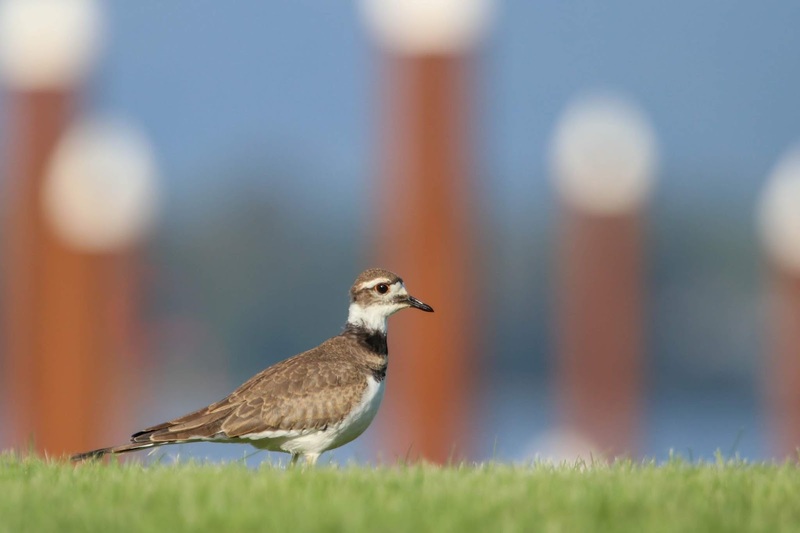 The devil's spawn was moseying around on the tiny grass lawn by the Tidewater Cove Marina. Back in the trees I was swarmed by chickadees for a few minutes. A pleasant swarm. It was a good little birding outing with three 5MR year birds added. 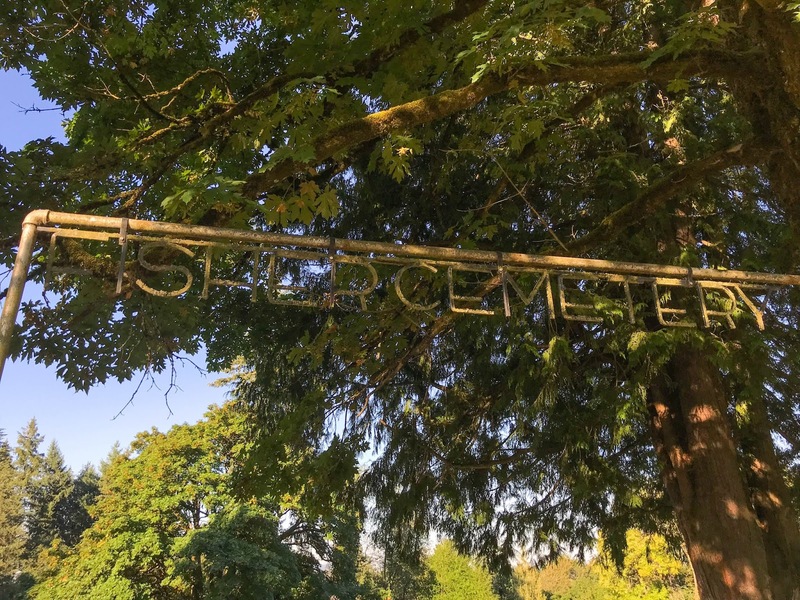 Another morning I decided to hit up a couple of old spots as well as new ones beginning with Columbia Springs Fish Hatchery. At East Biddle Lake, just east of the hatchery, a duck was swimming around refusing to be identified. 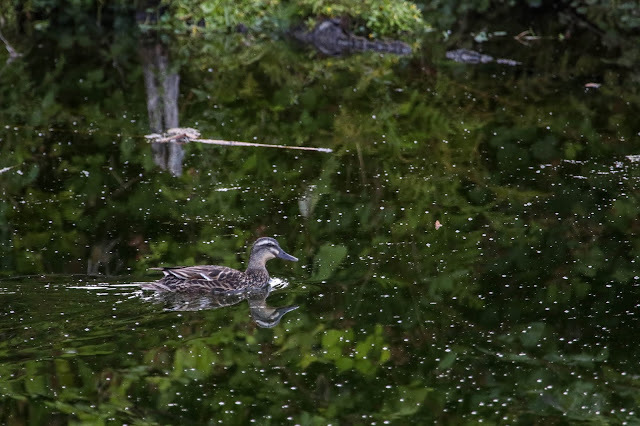 A Mallard had flown by earlier, and two Wood Ducks were way on the backside of the lake. I couldn't seem to turn this bird into either of those things. From the hatchery I was excited to check out a new spot I found on the map, a tiny river access called Peach Beach, snuggled between private residences on the river. Unfortunately when I arrived a youngish couple were out and about looking methy and I got the bad vibes. 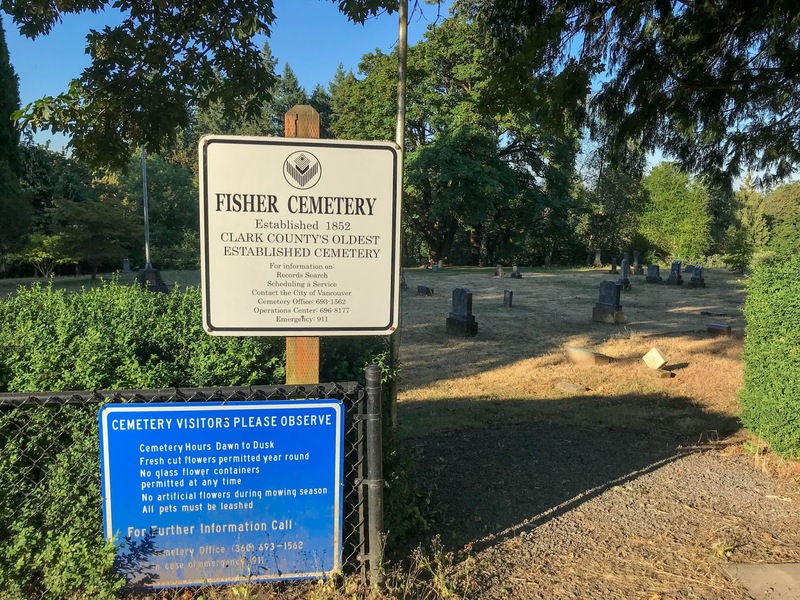 So I abandoned that idea and headed to my next new spot, Fisher Cemetery. I only had 13 species here but I really liked it. It's a decent size with plenty of trees, a tiny view of the river over someone's roof, maintained but not watered or anything. There's potential. 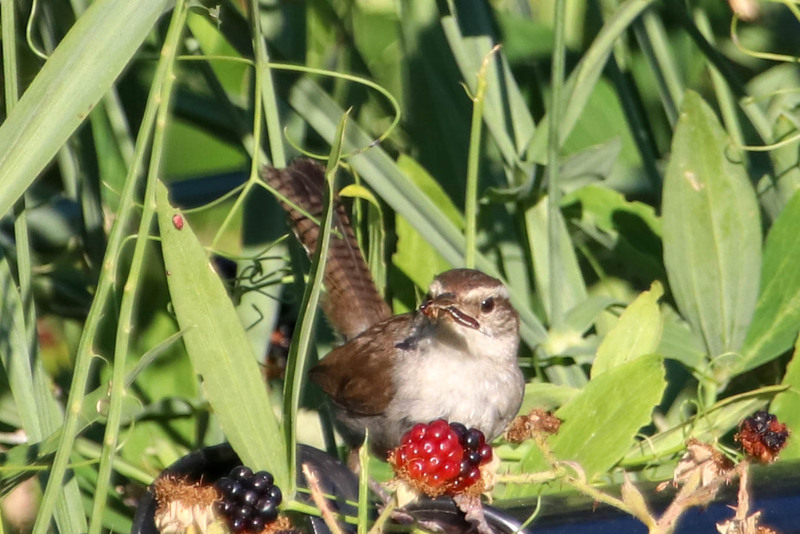 This Bewick's Wren bashed this earwig into submission and fed it to its children. Not the earwig's children. That would be interesting though. The pioneer section of the cemetery had the oldest graves though I found it odd that the "earliest recorded burial" was a 4 month old baby (July 25 1852- December 3 1852). 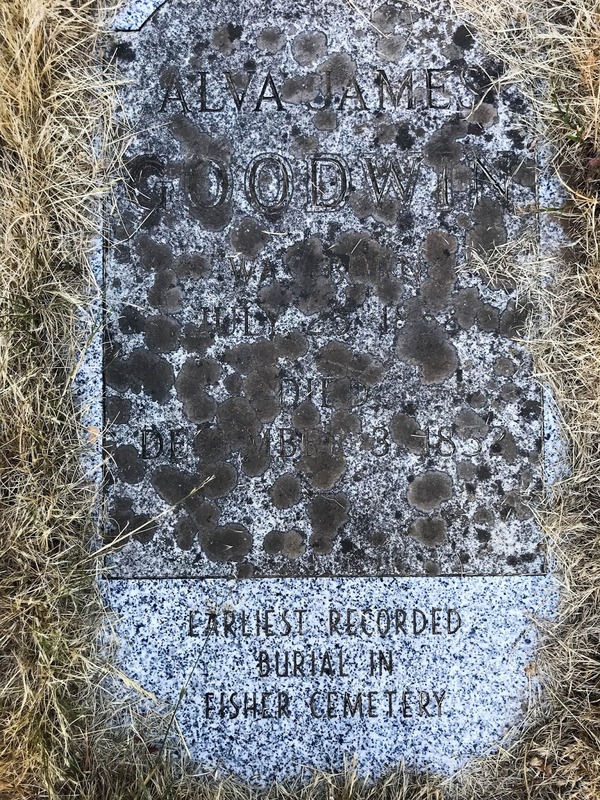 I guess I never thought about who the first person to be buried in a cemetery would be. From the cemetery I headed up to Pacific Community Park, a spot I visited once back in December. It's main draw is the large fenced-in dog park but there's also some trails, gardens, and a ball field. 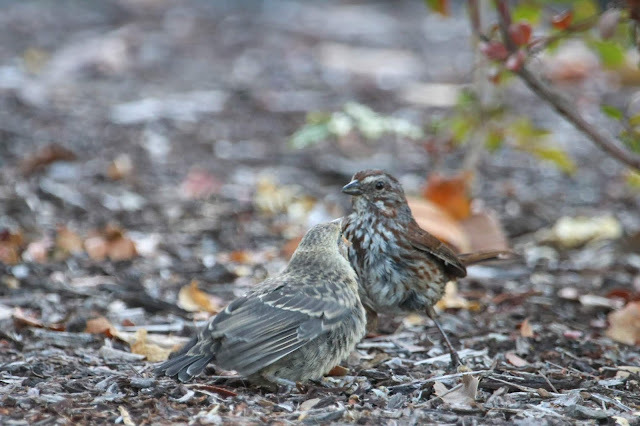 I was immediately charmed by all the young awkward towhees. As I was walking around an older couple with their Westies saw me with binoculars and a camera, and the man yelled out, "you looking for the owl?" I'm 98% sure this exact situation happened when I came here last time, most likely with the same people. I replied, "No, but if you know where one is...?" The man said, "Right here!" He pointed to some pine trees behind him then said "well, maybe not right now." I was ready to keep moving but then he said, "You know where Homestead Park is?" He proceeded to tell me about some young Cooper's Hawks he and his wife had seen the day before. I was interested but then he told me about how there are Williamson's Sapsuckers at Pacific Park. Sigh. 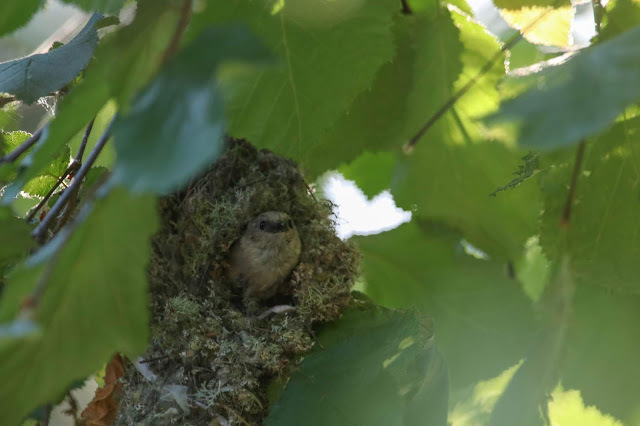 I kept walking and found a very noisy Bushtit nest. It was getting warm and I was thinking about heading home, but instead looked up Homestead Park on google maps. 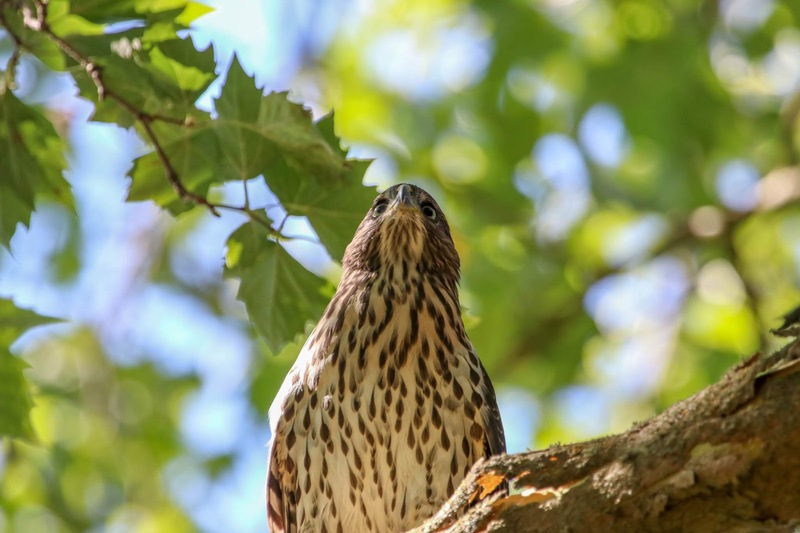 A new 5MR park with potentially nesting Cooper's Hawks is hard to resist. I arrived at the park and immediately heard a hawk calling. Ok, old man, you win this round. 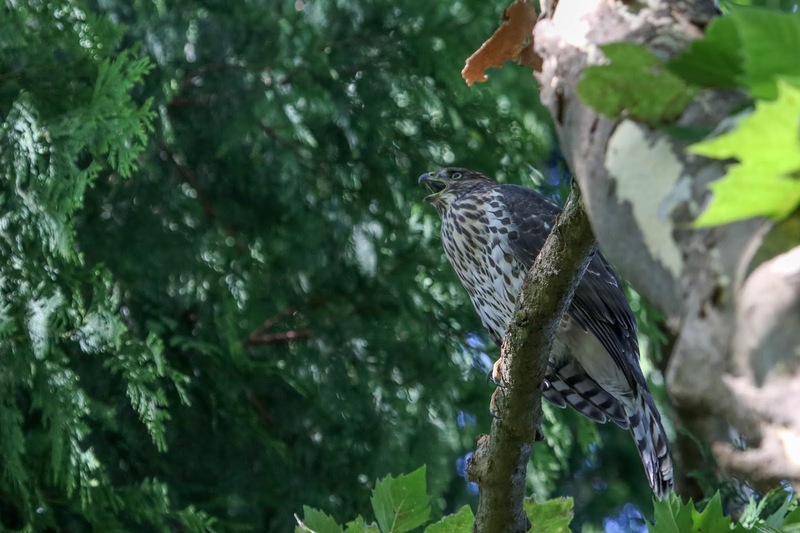 There were in fact three young Cooper's Hawks in this small neighborhood park. They were all pretty vocal which made it easy to do a headcount. 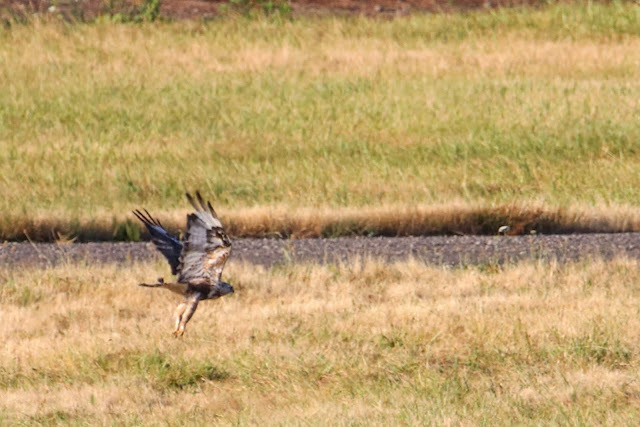 Plus they all flew together across the small field at one point. They did not seem to care much about gawkers as almost every person walking the short circular path stopped to stare at them (because they were SO LOUD). Pretty cool. Aside from the hawks, the park was a yawn bird-wise so I called it a day. July is certainly not the best time of year for birding but I am glad my 5MR list motivated me to check out some new spots. I had more fun than expected even though it was only the common birds for entertainment. Good times!!! Some good exploring! 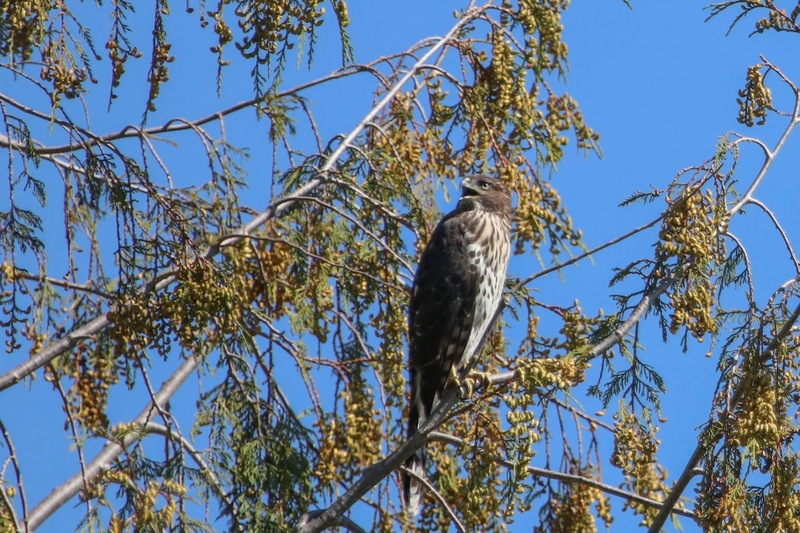 And I hope the Rough-legged Hawk can find some friends and gets back on track! I've been able to add a couple more birds to my 5MR and also birded a new site in my radius - it does inspire you to get out to nearby places you'd never though to go before! Yeah, I have been to so many weird little parks now! That duck is def confusing...Im not even going to attempt a guess, it looks like a mallard rear end with a ruddy duck face. Interesting old cemetery def fun to poke around in there I bet. Have a good weekend. Oof, it's been hot here also but luckily cools off at night so mornings are still good. Hope you get relief soon! Summer Rough-legged is so cool. 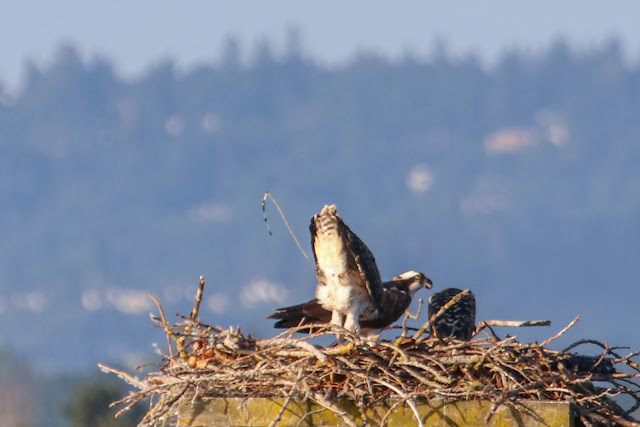 So is the projectile Osprey poop. Cool 5MR birds! Thanks! I really savor any opportunity to capture projectile poop with my camera. Have you considered Pacific Black Duck x Mallard for your mystery Duck? 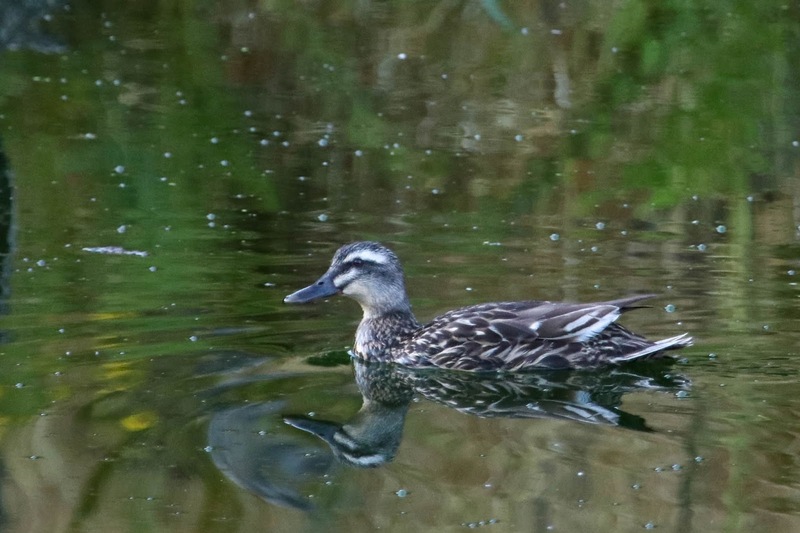 Colby made mention of this bird earlier today, and introduced the idea of Pacific Black Duck. It doesn't look quite pure to me for that species, but it seems they hybridize often enough in their expected range. As to how it got all the way over here, I have no clue. As always, great photos/content and its a real treat to read this blog. Thanks for the kind words, Nick. Colby did send me an email suggesting Pacific Black Duck (which I didn't know existed) and I have to say, there are a lot of similarities. Crossing with a Mallard could pretty much make this bird. 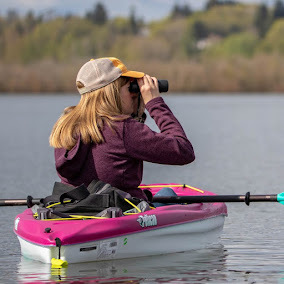 A fellow Clark Co. birder went over there today to look for it but didn't find any ducks at all. Going to try again soon in hopes of seeing the wing pattern.